This bronzer creates a really pretty, natural, believable tan on my face, neck and collarbones. I like that is not metallic, but doesn't look flat on my skin. The light shade is perfect for warming up my face that is normally covered in SPF 50 or greater and doesn't get any color. 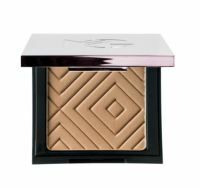 And there is something about square compacts that I really like -- a product design that Makeup Geek uses frequently.